The Honda City Turbo was the brainchild of Hirotoshi Honda, founder of well-known Honda tuning firm Mugen and son of Honda’s founder Soichiro Honda. When he created the City Turbo, Hirotoshi took one of Honda's most unassuming vehicles, the City, and turned it into an aggressive JDM pocket rocket, considered to be well ahead of its time. Impressed, Honda took Hirotoshi's idea and made a production version of it. In addition to the turbocharger, the engine included an aluminum/titanium alloy head and a magnesium valve cover to reduce weight. The body of the Honda City Turbo was made sportier by the addition of a new air dam with fog lights and an asymmetrical grille at the front with a spoiler over the rear hatch. The interior featured upgraded seats, while a digital dash and three-spoke steering wheel replaced the standard units. 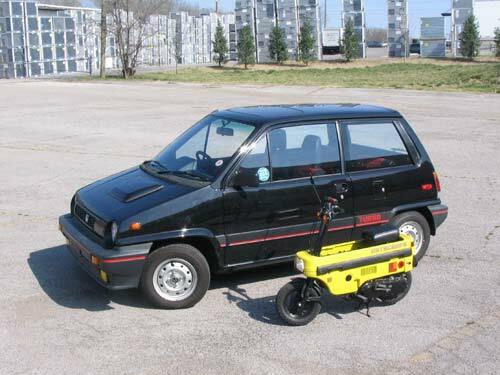 The Honda Motocompo scooter was an available option, designed to fit in the trunk of the City. It folds to a compact 1' wide, 2' high, and 3' long and weighs approximately 90 pounds. The car was very popular, with its “tall boy” styling providing a spacious interior, while the more aggressive bodywork earned it the nickname, “Bulldog”. Intended solely for the home (Japanese Domestic Market) market, City Turbos are starting to make their way to the US under NHTSA’s “25 Year Rule”. They are all right-hand drive. Car and Driver and Road & Track both featured the City Turbo on their covers in 1984, proclaiming it to be the best car Americans would never get to drive. Manufacturer: Honda Motor Co. Ltd.